The 10ft x 6ft Reverse Overlap Apex Wooden Shed is a great quality garden building for a low price. Boasting plentiful space inside, this garden shed is perfect for storing a variety of items such as lawnmowers and barbecues. The 28mm x 28mm frame supports the 8mm thick overlap cladding to create a solid structure that has been built to stand the test of time. The roof and floor have been built using a 9mm thick solid sheet material, this helps to form part of a rigid base that can withstand general daily use. The window is made from styrene glazing, a shatterproof material that is safer than traditional glass glazing. The apex roof provides extra head room inside that is perfect for storing larger items, the apex design also helps with water drainage. The supplied sand felt protects the wood from any water damage. To provide extra support, the single door has been braced with ledging, a pad bolt is included for security. This building comes with a 10 year anti-rot guarantee, meaning you can be rest assured this shed will remain solid for many years. Our Reply:Good afternoonThank you for your feedback today. I am sorry that you did not have enough felt for your building, but I a, glad that you were able to purchase some and have us refund you. Review:Good shed, but was damage. Thank you for your feview, we value your feedback and are always looking to improve both our products and services. Review:Materials seem a bit flimsy, but as I haven't built the shed yet, can't comment on the finished item. Thank you for taking the time to speak with me earlier and I am glad that, now erected, you are happy with the quality of your overlap shed. Thank you for your feedback. Review:Very flimsy panels. Some nails sticking out. You get what you pay for and we didn't pay very much. Thank you for the photo - your shed looks lovely! I am glad to know that you are pleased with the quality of your overlap shed. Thank yo again for your great review! 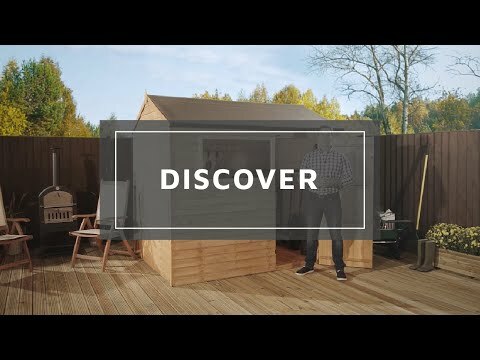 Review:Shed is very poorly made, the wood started to change shape as soon as it rained leaving some massive gaps unfortunately! Review:Value for money, good quality, simple installation. I am glad that you are happy with the high quality and value for money of your overlap shed and that assembly was straight forward. Thank you again for your great feedback. Review:but the instructions were woefully ambiguous at critical points，e.g. how the interior angles of the shed fit together and exactly where the roofl spar should be fitted. Both issues wasted a lot of time and refitting. Our Reply:Please accept my apologies for the fact that assembly did not go as anticipated and I am sure that now your shed is erected, it will be fit for it's intended purpose. Our Reply:It is fantastic to know that you think the overlap shed purchased is good value for money and thank you for providing your feedback. Our Reply:Fantastic for us to know that construction went well and was simple to carry out alone. Also great to know that you think your overlap shed is good value for money. Review:A lot of the boards are split, i've not decided how to deal with this yet as the shed is now up. suppose for £400 we should have expected it!! Our Reply:I’m sorry you aren’t completely happy with the floor, we do have the option of a floor support kit for our customers that provide added joists for extra support, which may still be an option for you.